A fun recipe for getting everyone involved in a bit of spring-time baking. 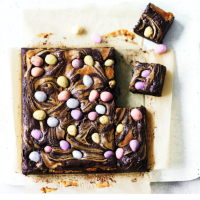 If you have any shards or crumbs of chocolate egg leftover, then get them swirled into these delicious brownies. Simply swap in the pieces in place of the dark chocolate listed below – and don’t forget to top with any rogue mini eggs you still have! 1. Preheat the oven to 180°C, gas mark 4. Grease and line a 20cm square tin with baking parchment. 2. Place the chocolate and butter in a heatproof bowl and set over a pan of gently simmering water, stirring occasionally, until melted. 3. Meanwhile, for the cheesecake mixture, beat together the dark muscovado sugar, vanilla extract, cornflour and 1 egg in a bowl. Gently stir in the soft cheese until mixed. Set aside. 4. In a bowl, beat the remaining 3 eggs. Stir in the chocolate mixture with the light muscovado sugar and flour. Spoon half of this into the tin, then drop in small spoonfuls of the cheesecake mixture. Spoon the remaining chocolate mixture over the top. Using a chopstick or skewer, lightly ripple the top, then bake for 15 minutes. Scatter over the Mini Eggs and return to the oven for a further 15-20 minutes until set. Set aside to cool in the tin before cutting into 16 squares to serve.